Broward County Sheriff Scott Israel has confirmed that 17 people died Wednesday afternoon in the shooting at Marjory Stoneman Douglas High School in Parkland, Florida. One dozen victims were killed inside the building, two were killed outside the building and one on a street near the school, Israel explained in a Wednesday evening press briefing. Two of the victims died of their wounds at the hospital. Several people remain hospitalized, local medical authorities said. Both students and adults died during the attack. "This is catastrophic. There really are no words," Israel said about the attack earlier in the day. The Parkland shooting resulted in more deaths than the Columbine High School massacre, in which 15 people, including the two perpetrators, lost their lives. The attack began shortly after 2 p.m., and heavily armed SWAT teams were flooding the school complex by around 2:40. 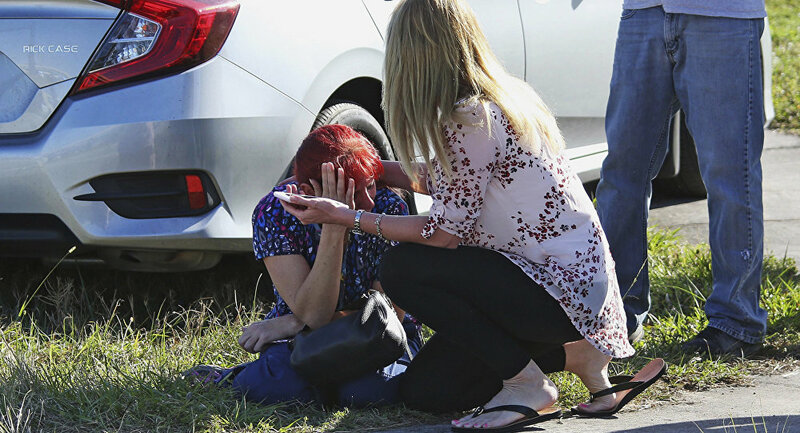 The shooter, Nikolas Cruz, was taken into custody at about 4:15. Israel said he brandished at least one AR-15 assault rifle and had multiple magazines. Cruz, 19, attended the high school he attacked but was expelled. Israel reported that law enforcement were searching his social media presence and had found disturbing content. “This is the 291st school shooting since the start of 2013 and the 18th in 2018. We all feel unsafe. What ACTION will you take to protect our children,” Shannon Watts, founder of Moms Demand Action, a grassroots organization seeking to address America’s culture of gun violence, said in a tweet to US President Donald Trump. “Prayers and condolences to the families of the victims of the terrible Florida shooting. No child, teacher or anyone else should ever feel unsafe in an American school,” Trump tweeted shortly after the attack. “Shame on any lawmaker or pro-National Rifle Association of America [NRA] pundit who offers ONLY thoughts and prayers today – without action, your hollow words make you complicit in the frequent, senseless, preventable slaughter of school-aged children,” Watts stated Wednesday.